Delivery of our trees is available throughout Arizona. Our delivery fee is encompassed in the price of the tree, and there are no additional delivery costs. All customers will be notified at least one day in advance of their delivery and are responsible for having adequate staff on hand to unload the delivery truck within a timely fashion. 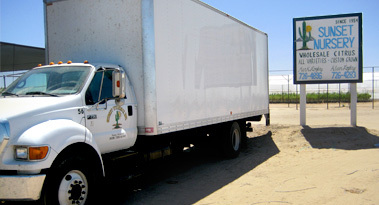 As it is only cost-effective to send a fairly full delivery truck, deliveries on some smaller orders may be delayed until other orders are received to complete the truck load. We apologize for any inconvenience this may cause.